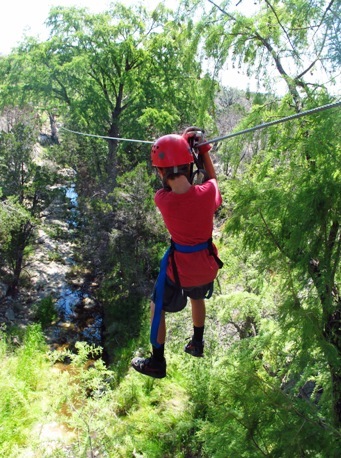 Getting a birds’ eye view of the Texas Hill Country is easy if you book a thrilling zip line tour. Central Texas has caught the craze with several places to experience the ultimate adventure. And it’s perfect for families (even your teen will want to do this with you). Zipping over Lake Travis near Austin. It’s okay to let out a couple of whoops and hollers; in fact, it’s expected. Just don’t forget to appreciate the scenery while soaring through a canopy of old growth oak trees, whizzing high above Lake Travis, or swooping among trees over scenic ravines. If you have yet to experience flying through the air while harnessed to a steel cable, it’s time to check out these popular zip line locations. 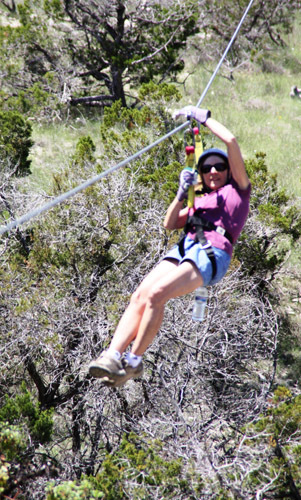 Soar between mountains (okay, large Texas hills) on ten lines ranging from 50 to 900 feet in length. More than three-fourths mile of wire cables cross canyons, creeks, and valleys of true Hill Country geography. Guides provide entertaining information about history of the Winn Ranch just south of Winberley, where the zip line is located, as well as plants in the area. Views take in a 15-mile panorama, so be sure to look out instead of down (forget that you’re 100 feet above the ground). Instruction includes zipping on a short practice line so guests build confidence before tackling longer lines. Length of each line is determined by the natural topography, and the last line is “blind,” as trees obscure the landing spot. 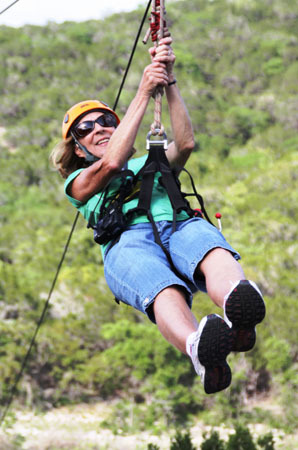 Wimberley Ziplines has an added element of excitement because participants must learn to stop themselves using its active braking system. Not just the first zip line in Texas, it’s the only canopy zip line with participants flying from tree top to tree top. Located 30 miles west of Austin, the tour takes guests over old-growth cypress trees and springs, traversing a ravine on six zip lines and three sky bridges. Take a leap of faith for an amazing view of nature with minimal impact on the environment. Add in a bit of rappelling for more fun. Stay at Juniper or Willow, secluded tree houses where guests can spend the night and enjoy sunset and sunrise accompanied by songbirds. After the canopy tour, guests may stay and have a picnic, including zipping to a dam-created lake for a cool dip. It’s an excellent family bonding experience. 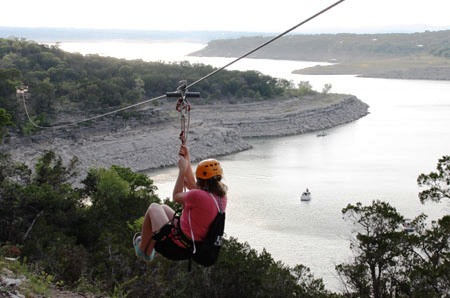 Experience the longest and fastest zipline in Texas at Volente Beach near Austin. Zip across incredible canyons and Lake Travis inlets on five zip lines ranging from 250 feet to more than 2000 feet. An automatic braking system leaves your hands free for waving to friends. For an absolutely thrilling finish, you’ll walk uphill to the 20-story high launch platform and whiz along on a screaming half-mile ride. Even better, it’s a dual line, so you can race your buddy to the end. Guides relate nature facts as you walk to each platform, and you’ll have access to a private beach where you can swim in the lake or relax in lounge chairs. Coolers and picnic baskets are delivered via boat. For the truly adventurous, schedule a two-and-half hour moonlight excursion featuring seven zips and views of the sparkling lake. Trust the equipment. Harness, helmet, and gloves (when needed for braking) are provided and double checked by the guides for proper fit. Listen carefully to instructions and follow them explicitly (each place and line is slightly different according to the particular set-up). Check age and weight restrictions before making reservations. I had my first zip-lining experience in Mazatlan a couple of years ago. I was terrified, but got up enough courage from somewhere to do it. Loved it!! Would like to try again and these that you've mentioned are probably just right. We've zipped all over the world. It's a fun experience and not nearly as scary as it looks at first. Glad you tried it.